The March issue of Table Talk Magazine is devoted to prayer. In this brief article by Burk Parsons, we can find much needed encouragement for the hard work of praying for our children. Prayer for our children comes naturally when we understand that God has created us as dependent creatures ourselves, made to depend on the Lord. God fashioned our hearts with an insatiable desire to commune with Him. Although prayer doesn’t always come easily, those of us whose hearts have been regenerated by the Holy Spirit cannot help but go to our heavenly Father again and again to give thanks to Him, to praise Him, and to ask for His help. We want our children to know the Lord and the joy of fellowship and communion with the Lord. We want them to be regenerated—to be born again—but we are unable to do that in our own power, for only the Holy Spirit has the sovereign grace and power to save our children. To that end, we can pray for our children even as they mature in their mother’s womb. We can pray first and foremost that God would sovereignly regenerate their hearts unto new life in Jesus Christ. 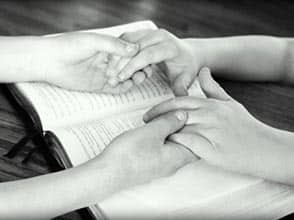 We can pray that our children would trust God, love God, love and obey the Word of God, confess their sins to God, worship God, and commune with God all their days. We can pray that the Lord would grant them humility, wisdom, discernment, honor, integrity, love, and grace in all of life. We can pray that they would trust and follow the Lord all their lives, that they would never know a time that they didn’t trust the Lord, and we can pray that they would have exceptionally ordinary testimonies of lives lived trusting and following the Lord. Beyond praying for our children, perhaps the most fundamental thing we can do is model a praying life before them. We are called to make disciples, and the Great Commission begins at home. We ourselves need to know more about prayer if we are going to teach our children in a way that equips them to pray genuinely on their own, in our absence. As our children mature, we can continue to explain to them what prayer is and how they can pray. We can pray with them, for them, and around them. We can also pray for their particular life circumstances and the work of God in their lives. As we continue to depend on God and enjoy communion with Him, we will help to reflect Christ in our own lives, pointing our children not to ourselves but to their heavenly Father—that our God might use us sinful and broken vessels as models of a repentant and faithful prayer life in communion with Him. May our children see us rejoicing always, praying without ceasing, and giving thanks in all circumstances as we long for our Lord’s kingdom to come and His will to be done on earth as it is in heaven (1 Thess. 5:16–18; Matt. 6:10).